Sermão / Pregado plo Muy Docto / Haham Anehela / R. Abraham Mendez Chumaseiro / de G.M. / No K.K. 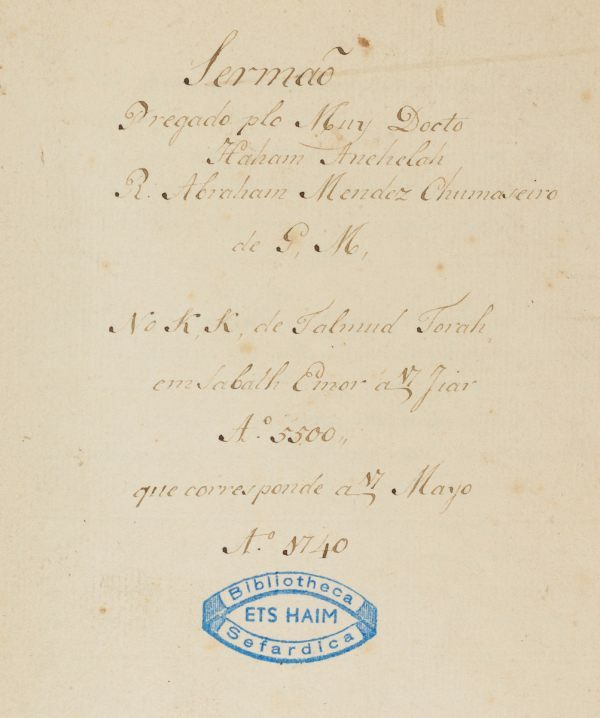 de Talmud Torah / em Sabath Emor a 17 Jiar / A.o 5500 / que corresponde a 17 Mayo / A.o 1740. Text in Portuguese with some Hebrew annotations / Paper / 26,9 x 21,7 cm. / , 39 pp. / 23 lines to a page / Current writing with some Sephardic cursive / Catchwords at the end of each page / Leather binding.